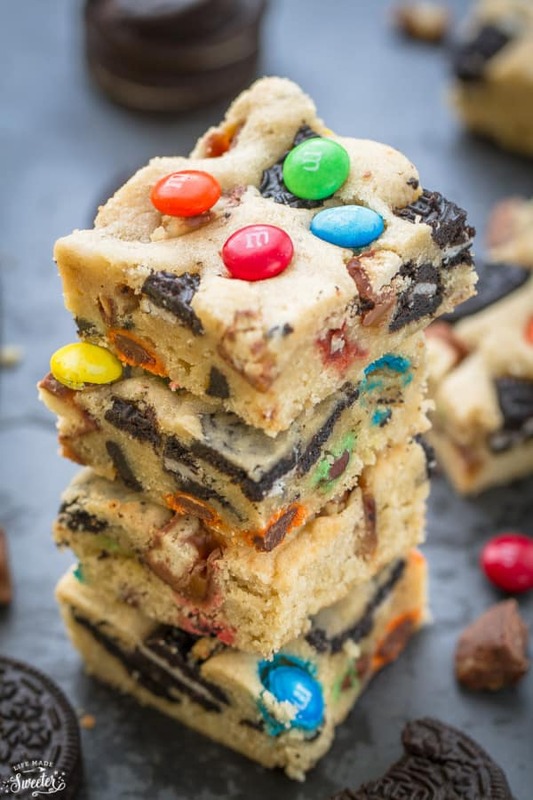 Candy Oreo Monster Blondie Bars are perfectly soft, chewy and loaded with M&M’s, Twix & chopped Oreos. 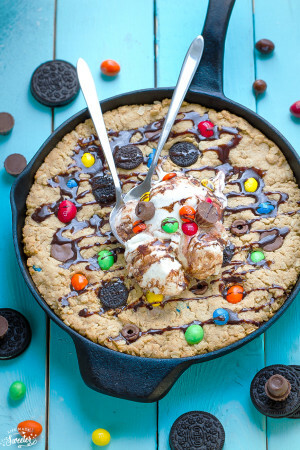 The best part about these is all the fun Halloween Candy you can re-use. Is your pantry overflowing with half-opened bags of candy? 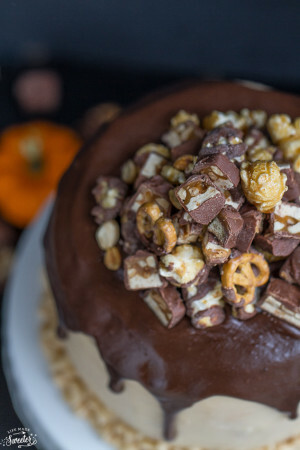 If you’re like me and trying to find ways to reduce that leftover candy stash, tossing them into some baked goodies is an easy and delicious way to help get rid of some. 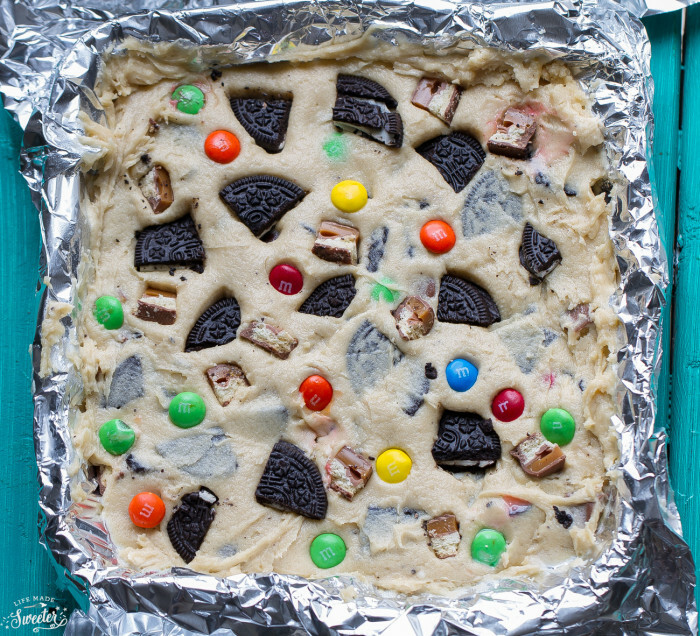 I made these Candy Oreo Monster Cookie Bars a few weeks ago and we couldn’t resist throwing in whatever all the half-opened packages of treats we could find. They start off with my favorite soft blondie base from America’s Test Kitchen. They are my absolute favorite and no-fail recipe that I’ve been using for years. Then you just toss in whatever candy you have lying around. 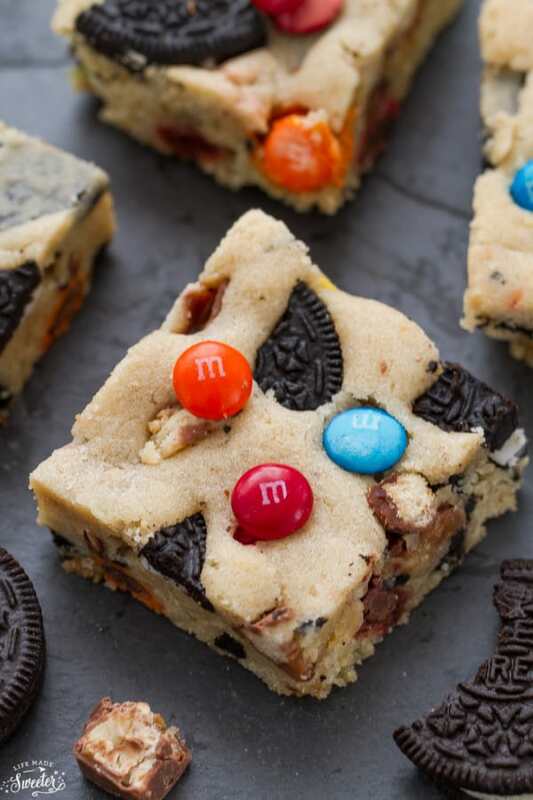 These Candy Oreo Monster Blondies bake perfectly in about 30 minutes and you’ll have soft, chewy bars that are thick and full of texture with a slightly gooey center. Best of all, they are a great way to use up any leftover candy taking over your pantry and everyone will love this fun and delicious treat! 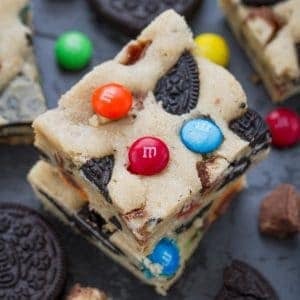 Soft and chewy loaded Candy Oreo Monster Blondie Bars - a great way to use up any leftover Halloween Candy. Preheat oven to 350 degrees Fahrenheit. Line an 8-inch baking pan with aluminum foil, leaving a slight overhang on the sides. In a large mixing bowl, whisk melted butter with brown sugar. Add egg and vanilla and mix until combined. In a separate medium bowl, whisk together flour, baking powder and salt. Slowly add the dry ingredients to the wet and stir together until just combined. 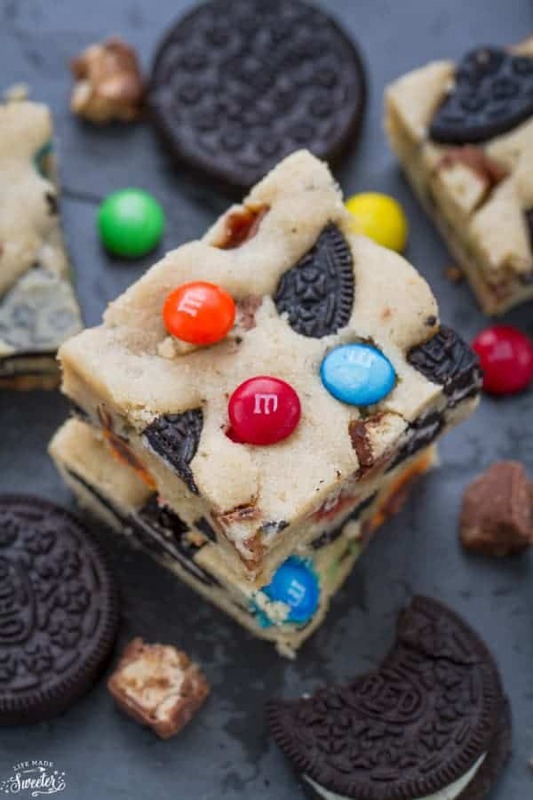 Fold in the half of the M&M's half of the chopped Twix bars and half of the Oreo cookies. Spread dough evenly into prepared baking pan and smooth out with an offset spatula or clean hands. 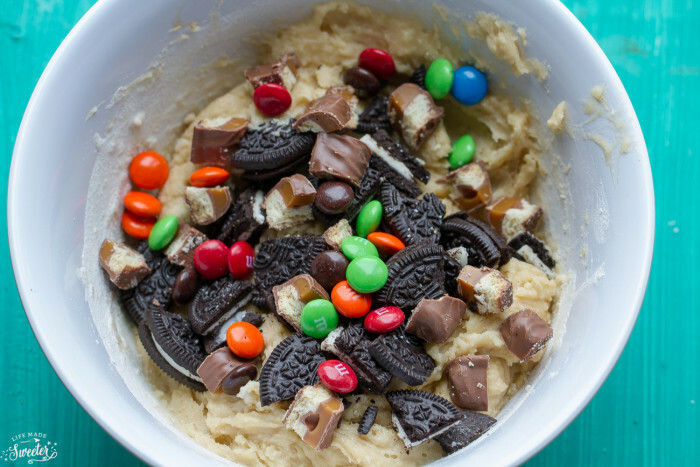 Evenly place more candy and Oreo cookies on top. Bake for 22-25 minutes or until lightly browned on top. Do not overbake. Remove from the oven and allow to cool completely before cutting into squares. Leftover bars can be stored in an airtight container in the refrigerator or at room temperature for up to 1 week. These bars look beautiful, Kelly!